Building a deck from scratch is one of the toughest DIY projects one can take on. Think about it..it’s just some wood and a bunch of screws right? Thinking to yourself, you firmly believe this is something you can confidently do yourself and I believe in you. We have all been on at least one and thought, ‘yea I can do this.’ Building any deck is a difficult project many people successfully complete. Follow this article for an overview of where to start when building a deck from scratch. Decks are like complex math problems as you’re sure to experience errors or objections throughout the process. This is the reason why there are whole books dedicated to the subject as it requires some critical thinking and problem solving. Kick things off by first making sure you obtain the required codes and permits. 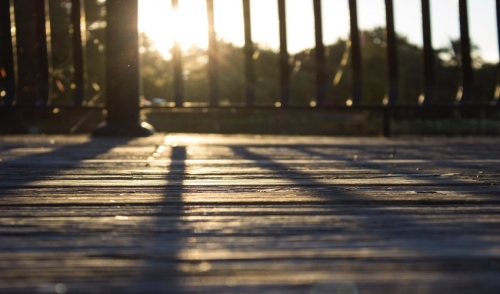 Every local building authority has a different set of rules and regulations that must be followed when it comes to adding a deck to your home. Once you have what you need, start planning. When people ask me where do you start when building a deck, I alway tell them the process begins with visualizing the deck. The more you consider all of your options, possibilities, and challenges, the smoother building your deck will go. Do your homework and put together a solid blue print that will serve as the foundation of your project. This plan should answer questions such as will the deck be anchored to the house or freestanding? While the answer to this question is provided in the blueprint, be mindful of the process and work it will take to make it happen. Anchoring to the house requires the removal of siding while freestanding could mean more concrete work and deeper holes for the post. These are a couple of the many things you must plan and solve for when building a deck from scratch. The next step to starting your deck is collect the materials. Not only are you going to need a variety of tools, you’re also going to need a lot of wood. Visit your local hardware store for both. You can rent useful tools such as cement mixers and miter saws at affordable rates. In regards to lumber, the deck is going to require a lot of it in a mix of different dimensions including 6x6 or 4x4 posts, 2x10s or 2x12s for joists and beams, 2x4s for structural members, and decking boards for the surface of your deck. Make sure to grab the right wood species like cedar or redwood and pressure treated pine for key structural components. Once you have everything it’s time to start putting it all together according to plan. Prepare the site where the deck will go and install your ledger board which will serve as the anchor to the framing of your entire deck. Once your ledger is properly installed, you can start to move on to installing the footings and posts. From there you can move forward with completing the rest of your deck. This is where you should start when building a deck from scratch. Visualization and proper planning are the key to starting and completing a new deck.